Man, building an aircraft carrier is just like playing with Lego bricks! At a much, much larger scale, of course. Here is footage showing how the final section of the Queen Elizabeth-class aircraft carrier the HMS Prince of Wales was slapped on top of the ship. 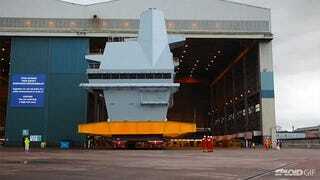 The piece, known as Aft Island, weighs 750 tonnes and will control aircraft operations on the carrier.